Better for Kids Reading: Print or Digital? A new study out of Europe suggests that readers of print books are at a big advantage to readers of ebooks when it comes to reading comprehension. If this is true, will reading more ebooks and fewer print books as a society make us dumber? Can tablets help children learn skills like penmanship? Can interactive apps foster appreciation for the sounds of language? Kumon Publishing North America is exploring these questions by introducing two digital apps for kids – Uppercase ABC’s:Learn To Trace Letters and Pittsun-Tsun: The Sounds of a Rainy Day. ABC’s is a digital workbook that teaches kids to write the alphabet by having children use a stylus on a tablet to practice forming letters. Pittsun lets young children interactively experience early reading skills and onomatopeia. Read this Book Business article for more on how publishers are deploying low-tech and high-tech content to engage kids and get them invested in reading. As foundational as it is to our lives, reading is not natural. Reading must be learned, and that means it must be taught. Whether a child enters through the printed page or a digital screen, the world of words promises rich rewards. 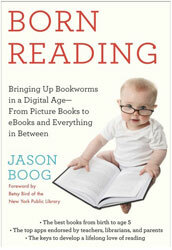 Author of Born Reading: Bringing Up Bookworms in a Digital Age, Jason Boog insists there is much a parent can do to make that world of words a more welcoming place. He has assembled what amounts to a playbook for coaching and coaxing children to be lifelong learners. The key, Boog tells Chris Kenneally, is for parents to learn how to read to their sons and daughters. The method is simple: be interactive. As publishing editor for Mediabistro, Jason Boog previously led the GalleyCat and AppNewser blogs. He now works in Hollywood at True Pictures as director of its story investigation department.